The Good Shepherd and St. Peter’s are parish churches. If you live in our parish, then you’re entitled to have your service in our churches. If you’re interested in getting married, or having your child christened, then please get in touch – we’d love to help with your celebration. We’re also here to help with the hard times too – whether that’s the funeral of a loved one, or providing a listening ear. If you’re not sure which parish you live in, please check the Parish Finder. We also offer a special ‘service of thanksgiving for the birth of a child’. This is a great opportunity to give thanks, and to pray publicly for the child and their family. 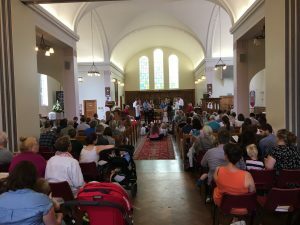 This service is suitable for those who would prefer not to make the promises of baptism, or for those who want their children to make their own choices in later life. Baptisms and thanksgivings take place as part of our Sunday morning services. A church is so much more than simply a venue for your wedding. A church wedding is personal, meaningful, spiritual and beautiful. 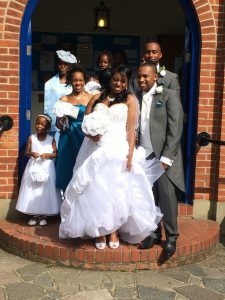 If you’d like to find out more about getting married in our church, please get in touch, and we’ll arrange a time to meet with you. The vicar will get to know you, talk you through the legalities and practicalities, and help you create a wedding that’s unique and memorable, and reflects your story. We also offer evenings and short courses of marriage preparation that give couples a chance for a ‘relationship MOT’ before they tie the knot. As a parish church we’re here to look after the people in our local area – whether or not they come to church. If you feel that a Christian funeral is right for you or your loved one, then we would be glad to host it, or take the service elsewhere. Ask your Funeral Director to contact us, or get in touch if you have any questions. We recognise that people need a lot of care and support when they lose a loved one. If you’d like to talk to someone, or have an opportunity to sit quietly in church, please do ask. 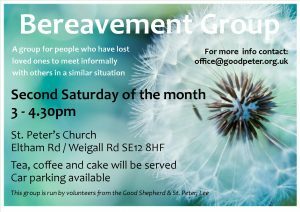 We also run a Bereavement Group that meets once a month on a Saturday afternoon.